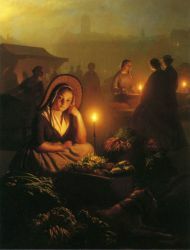 Petrus Van Schendel, (1806-1870) Born in Belgium, van Schendel's family was of Dutch origin. He studied at the Antwerp Academy and worked in Antwerp until 1828 when he left for Holland, living in Amsterdam, Rotterdam and The Hague before settling permanently in Brussels in 1845. 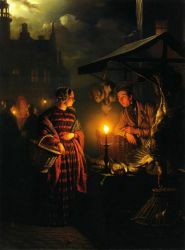 It was from this date that he began his market scenes. 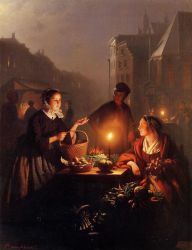 This same year he won a gold medal at the Brussels exhibition, "Market by Moonlight", and again at the landmark 1857 Art Treasures Exhibition in Manchester with a painting entitled "A Fish Market", he exhibited at the Royal Academy, London in 1855 1856. He was also a successful portrait painter of some note. 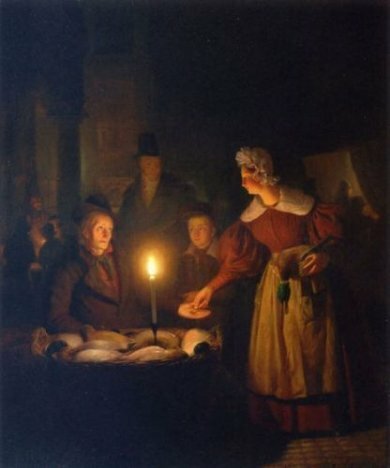 One of van Schendel's most prominent followers was Johannes Rosierse (q.v.) 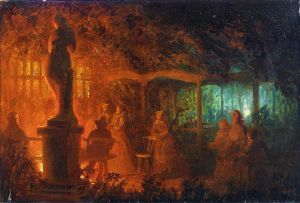 His works can be found in museums in: Amsterdam, Rijksmuseum; Rotterdam, Museum Boymans van Beuringen; Melbourne; Montreal; Munich; Nice and Stuttgart.